Named by a local rancher for Saint Anthony of Padua, Mount San Antonio may be the official name of the peak but in SoCal everyone just says "Mount Baldy". 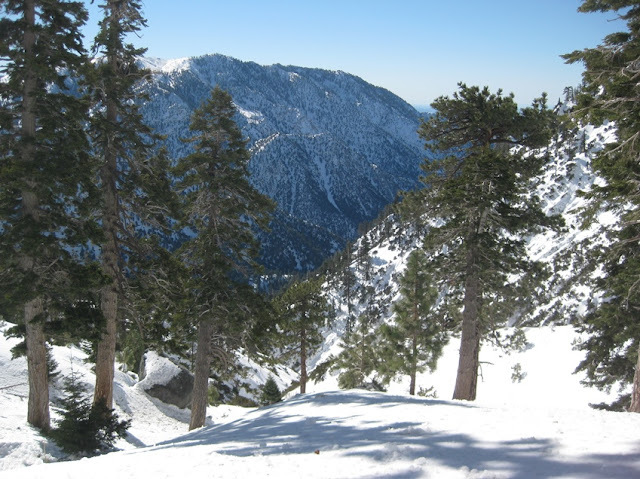 There are actually two peaks with the main one at 10,064 feet (3,068 m) and West Baldy, at 9,988 feet (3,044m) and they are in the front country range of the San Gabriel Mountains. Mount Baldy is great as a hiking destination but I really like it when a big snowstorm that transforms the dusty trails into miles of winter challenges. 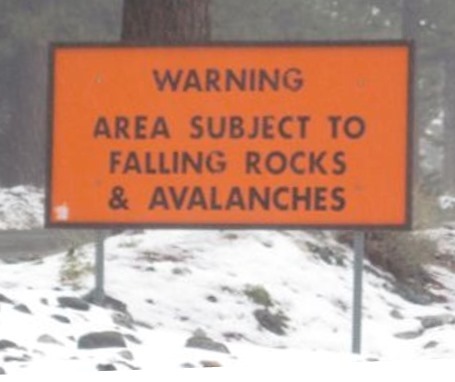 On the drive to the trail head I saw this sign which ties in to an incident three days before my hike. 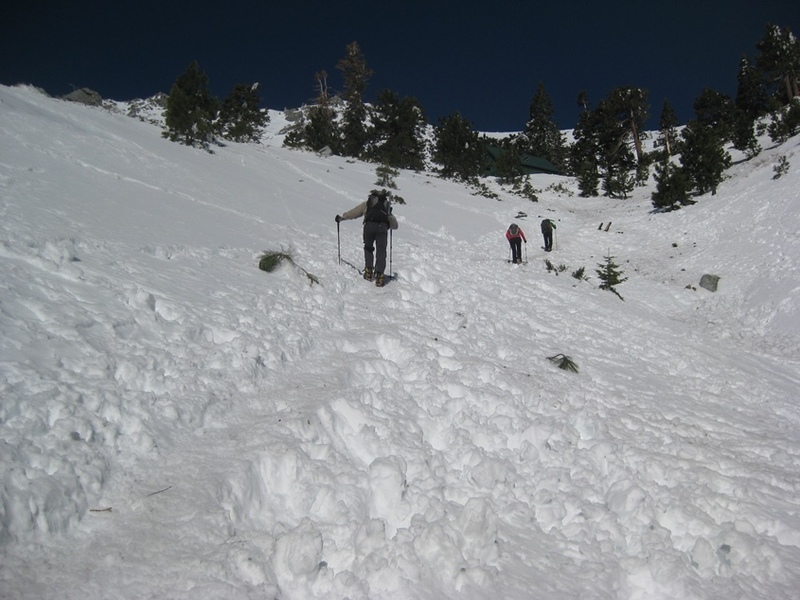 Rescuers were called to the Mt. Baldy Bowl area about 12:15 PM for a reported avalanche that injured three men. That is a time of day when the sun has warmed the upper areas of the Baldy Bowl and primed the steep slopes for an avalanche of any heavy loads of snow. 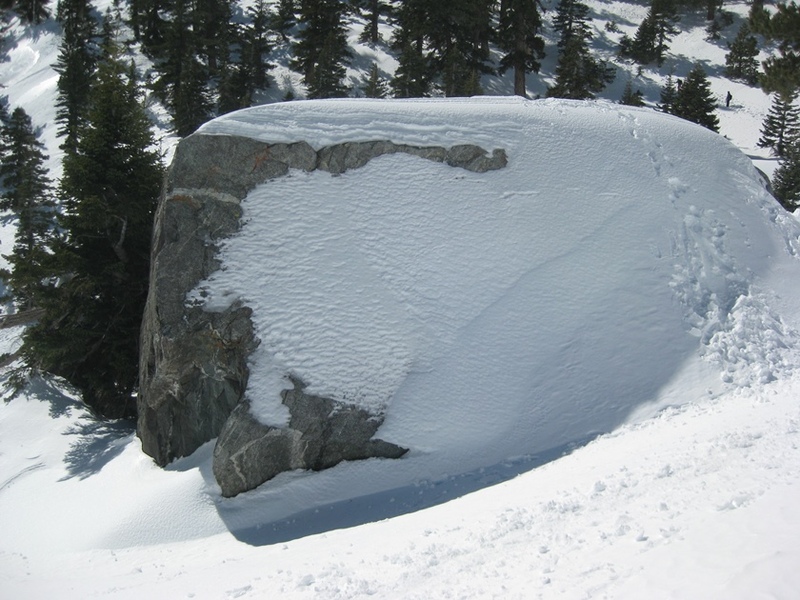 Cody Ayala was hospitalized with broken ribs and Chris Chung was reported to have a broken arm. Louis Wojciechowski was released after getting stitches for a cut leg. 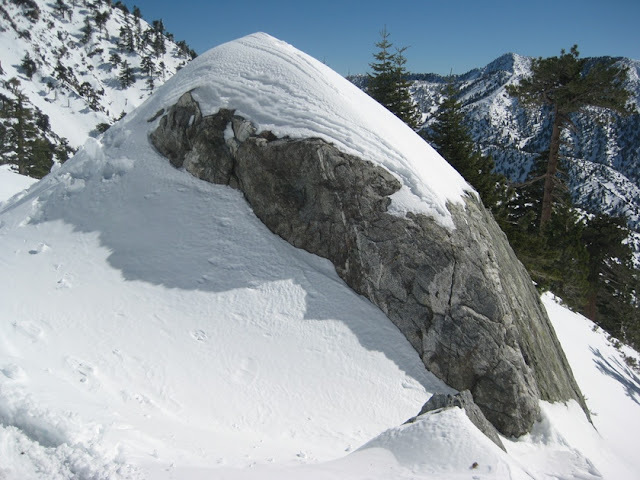 Wojciechowski commented that the speeding wave of snow swept the three men in different directions and he was briefly buried. Authorities say the men slid about 1,000 feet down the face of the bowl where they were ascending. 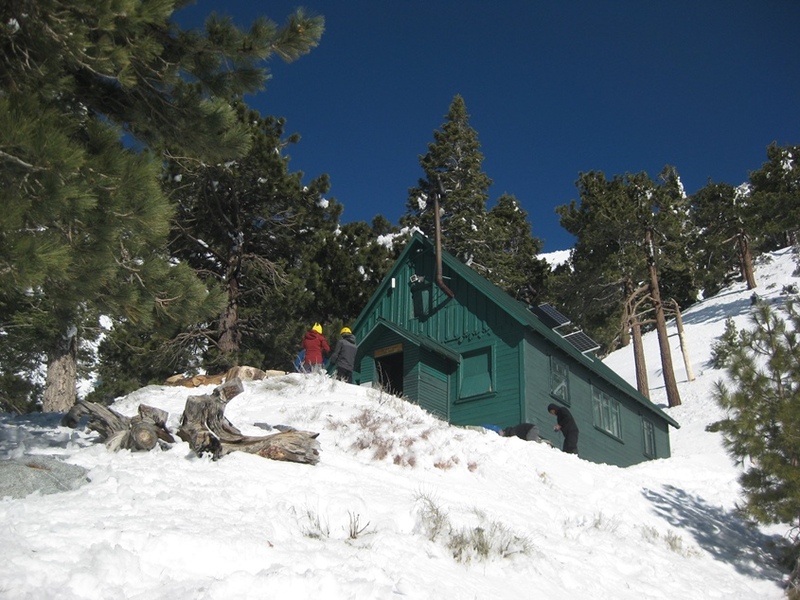 Ayala and Chung were hoisted to safety by a San Bernardino County sheriff’s helicopter. This incident factored into my plans to hike no further than the area of the Baldy Bowl and not attempt to ascend to the summit. 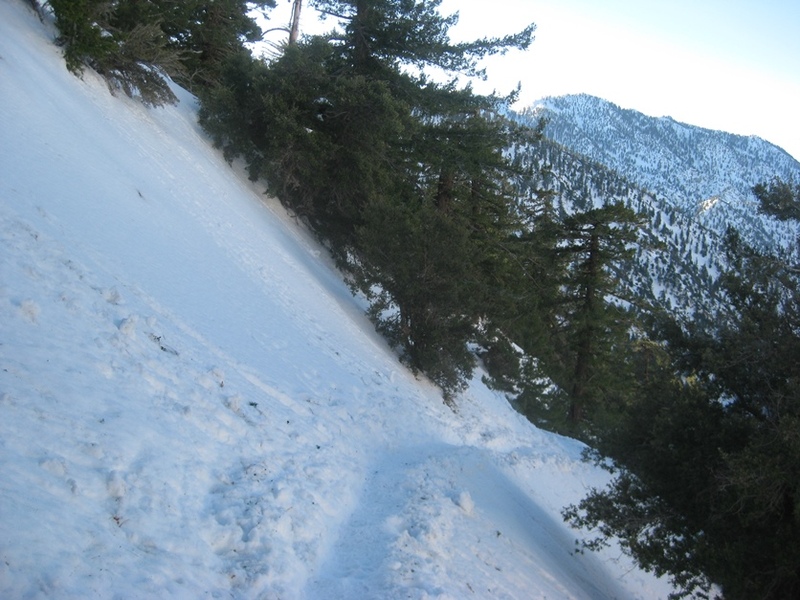 Because of the massive crowds that want to play in the snow at lower elevations I had to get to the Manker Flat area well before 7 AM to secure a good parking spot. 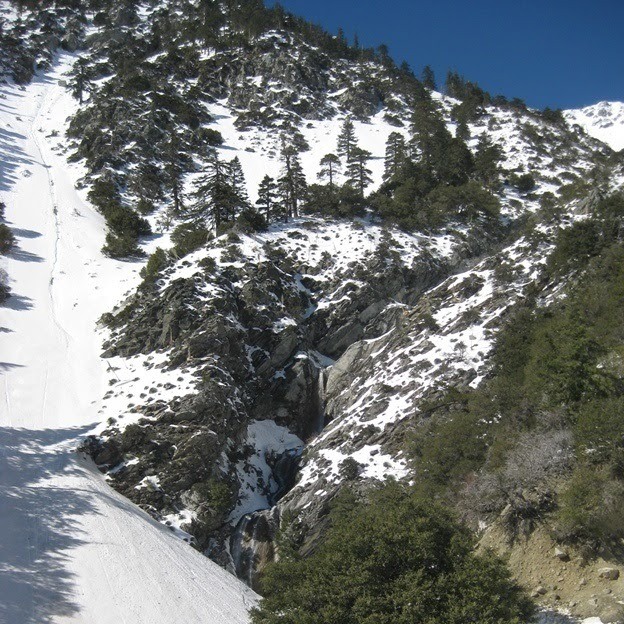 Starting from Manker Flat the route followed a snow covered road about six tenths of a mile towards San Antonio Falls. 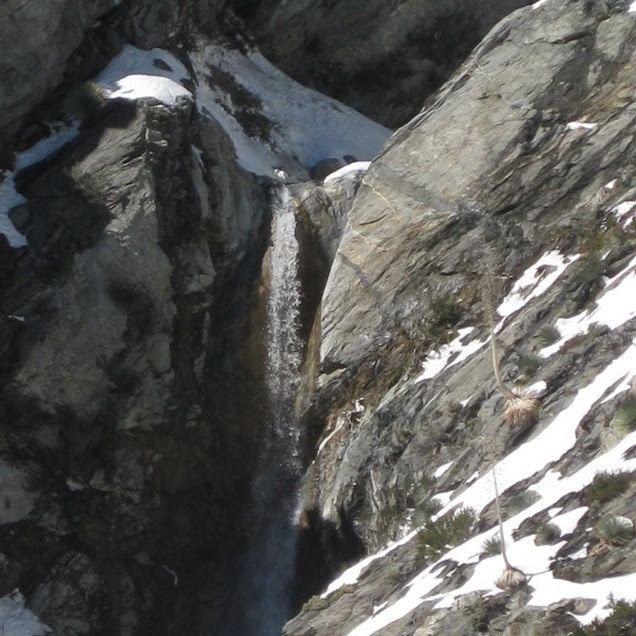 A natural spring near the ski hut is the source and plenty of water was cascading down the falls today. 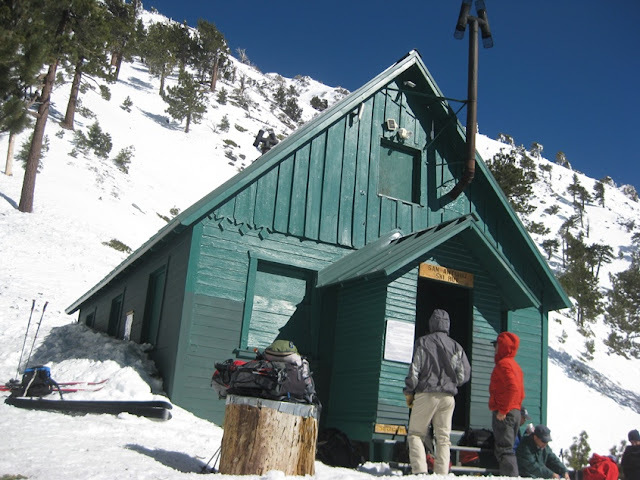 Abut a third of a mile past the falls a hard left from the road puts you on a trail that ascends to the 8,300 foot elevation level where a picturesque ski hut is located. From there I planned to hike part way into the Baldy Bowl area and then head back down the trail to my truck. 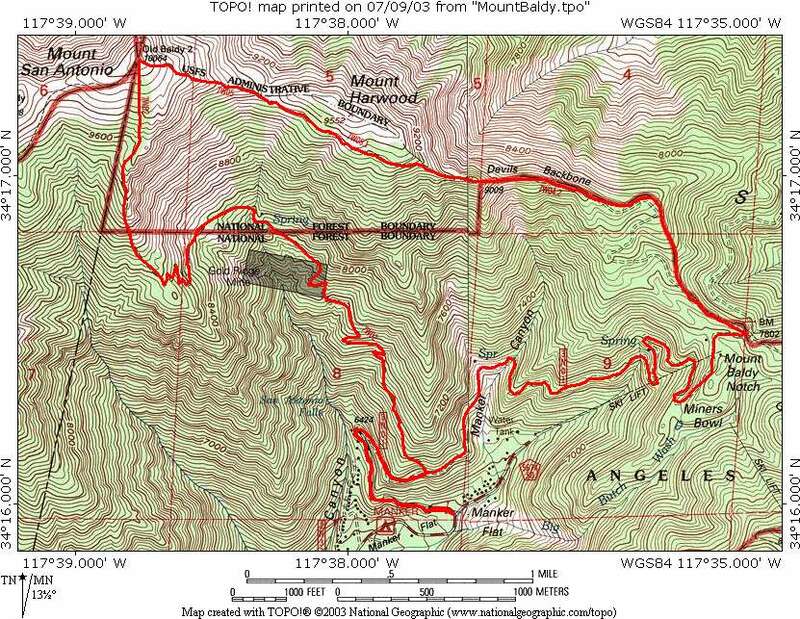 As seen on the map you can make a loop but the area called the Devil's Backbone can be treacherous in winter. The day started out cold and windy and for this hike I brought crampons instead of snowshoes because I fully expected icy conditions. 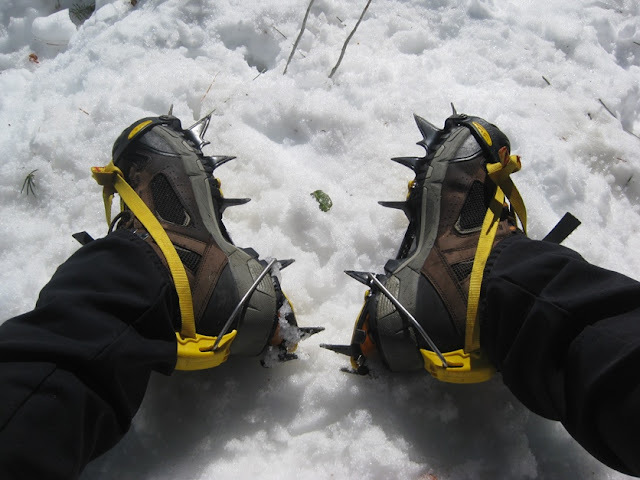 Here is a picture of my Grivel 12 point crampons. They are my "go to" set for all of the mountains I have climbed. 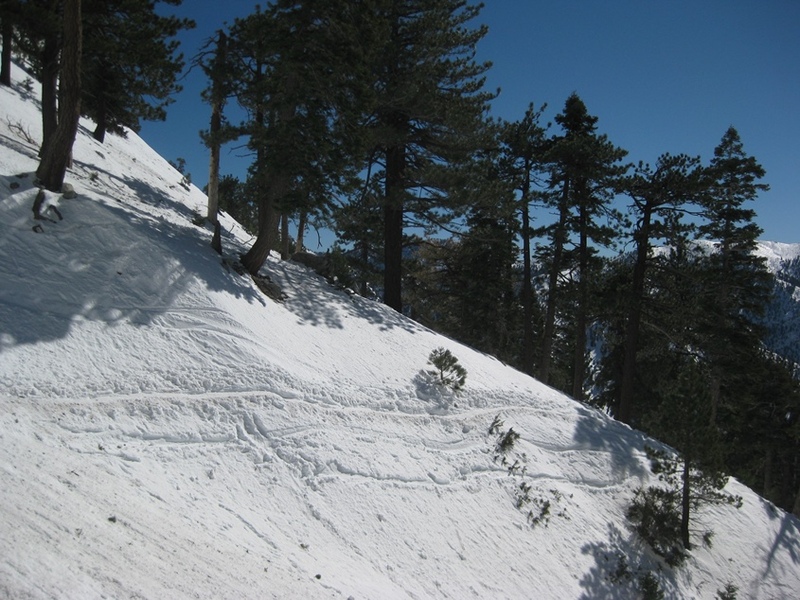 Many of the routes heading to the ski hut were not even one foot wide and crossed the steep blankets of snow on the slopes. 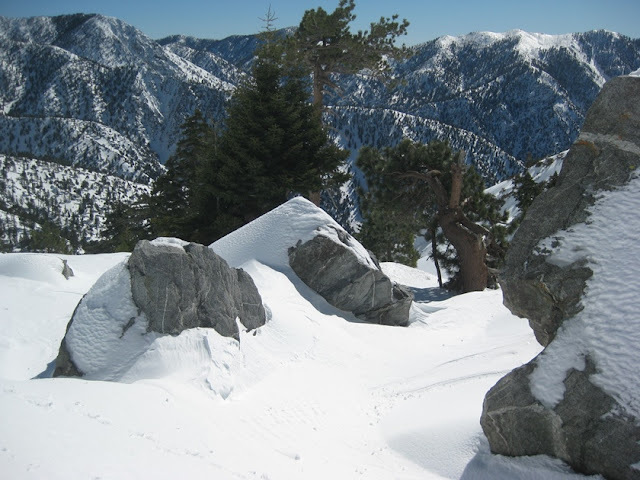 Although the area was not crowded there were a fair number of groups and individuals sharing the crisp snow and the expansive views that stretched all the way to Catalina Island. 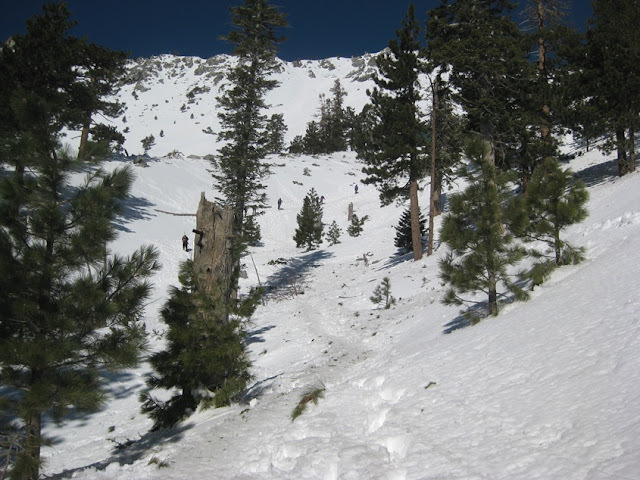 Heading up the final steep slope to the ski hut. 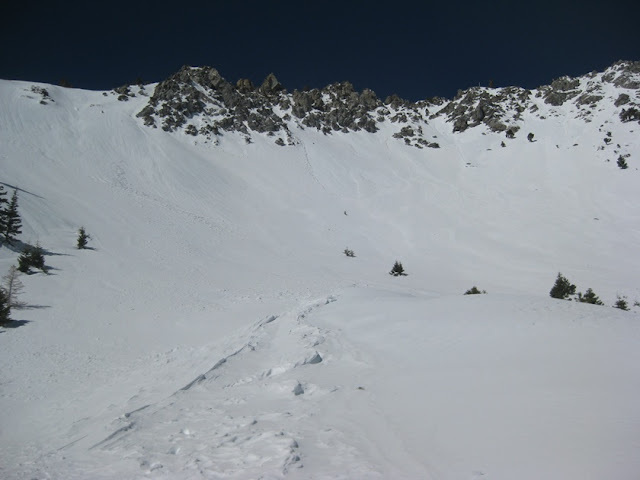 After a quick snack break at the hut I headed over to the bowl to take in the views and also ID the area where Thursday's avalanche occurred. 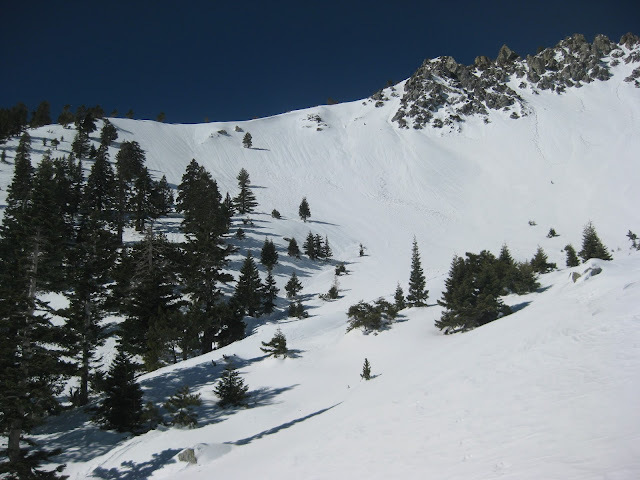 The next set of pictures is a left to right set of snapshots of the bowl area. 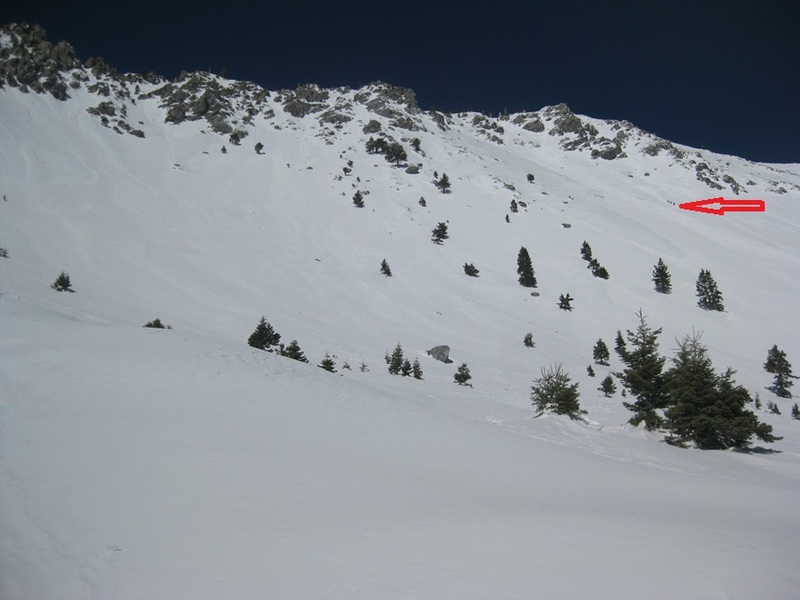 The third photo has a red arrow on the right pointing out where the avalanche occurred. 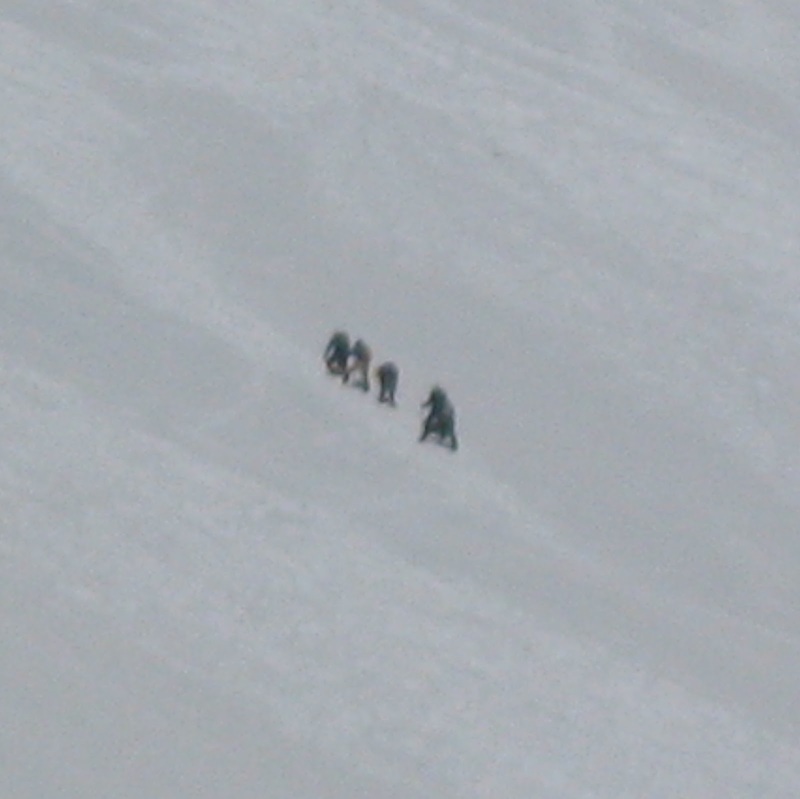 Four climbers can be seen ascending the route around 10 AM. Here is a blurry shot the the four climbers in the avalanche zone. The wind has sculpted snow over the large boulders in the bowl, transforming their stark exteriors with a whole new appearance. 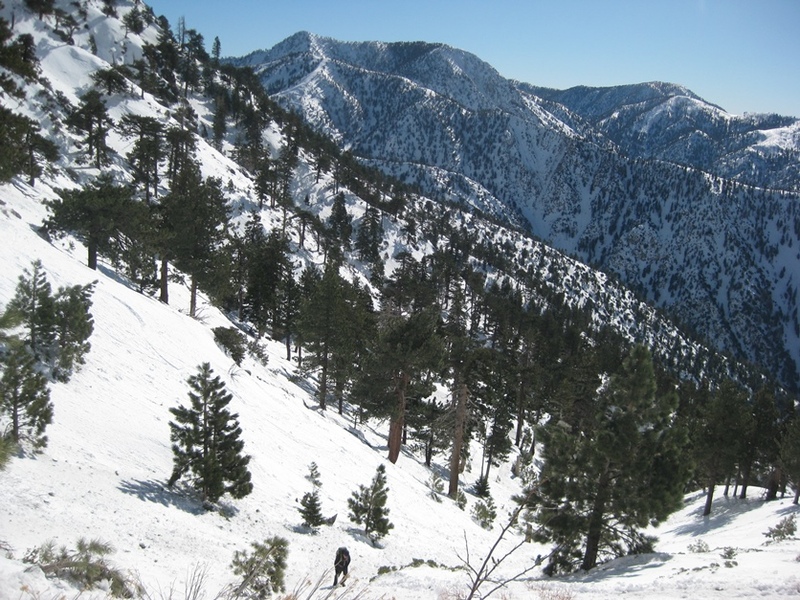 Thanks for trekking up the slopes of Mount Baldy with me! If you like the pictures and narrative please share my blog with your friends. 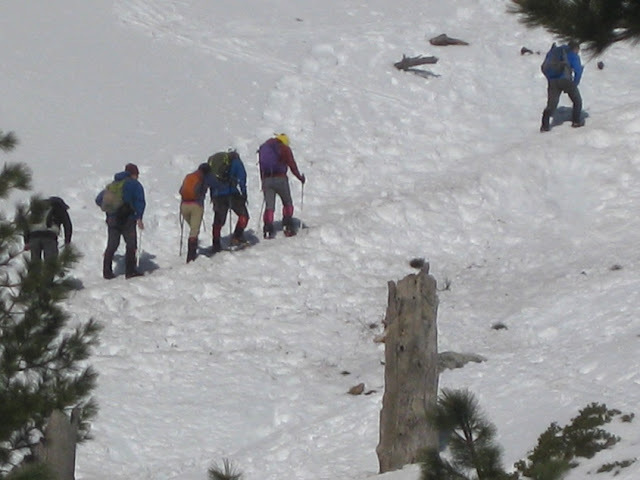 I hope that you are inspired to head out and create your own adventures. 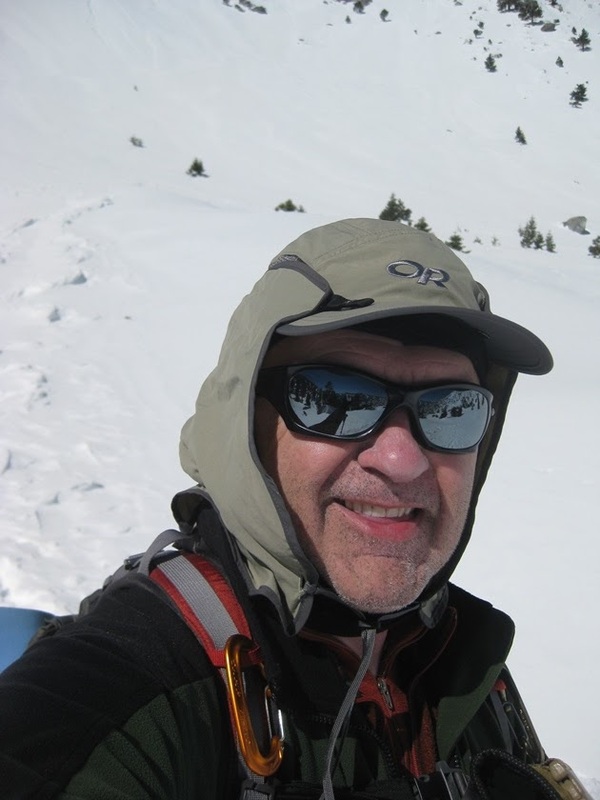 Very nice, thanks for sharing your adventures! Almost makes me wanna get out there in the snow too!